Under the Whyte notation for the classification of steam locomotives, 4-8-4 represents the wheel arrangement of four leading wheels on two axles, eight powered and coupled driving wheels on four axles and four trailing wheels on two axles. The type was first used by the Northern Pacific Railway, and initially named the Northern Pacific, but railfans and railroad employees have shortened the name when referring to the type, and now is most commonly known as a Northern. The 4-8-4 wheel arrangement was an obvious progression from the 4-8-2 Mountain type and, like the 2-8-4 Berkshire and 4-6-4 Hudson types, an example of the "Super Power" concept in steam locomotive design that made use of the larger firebox that could be supported by the four-wheel trailing truck, which allowed improved free steaming, particularly at speed. This was combined with the stability at speed brought about by the four-wheel leading truck and the greater adhesion of the eight driving wheels. The evolution to the 4-8-4 type occurred in the United States of America soon after the Lima Locomotive Works introduced the concept of "Lima Super Power" in 1925, making heavy 2-8-2 and 2-8-4 type locomotives. The prototype was built to Super Power principles by American Locomotive Company (ALCO) for the Northern Pacific Railway (NP) in 1926, with a four-wheel trailing truck to carry the weight of a very large firebox that was designed to burn low quality lignite coal. The potential benefit of supporting a firebox with a 100-square-foot (9.3 m2) grate on a four-wheel trailing truck was quickly realized by locomotive designers since, given the truck’s additional weight of approximately 15,000 pounds (6.8 t) and the 55,000 pounds (25 t) of additional engine weight that a four-wheel truck could carry above that of a two-wheel truck, the difference of 40,000 pounds (18 t) was available to be used for increased boiler capacity. The 4-8-4 type arrived on the locomotive scene at a time when nearly all the important design improvements had already been proven, such as the superheater, mechanical stoker, outside valve gear, the Delta trailing truck and the one-piece bed frame of cast steel with integrally cast cylinders, which did much to advance the application of roller bearings on steam locomotives since it gave the strength and rigidity to hold them in correct alignment. In 1930, the Timken Company actually used a 4-8-4 built by ALCO with roller bearings on all axles and called the Timken 1111, to demonstrate the value of their sealed roller bearings over nearly every mainline in the United States. The Timken 1111 was subsequently sold to the NP, where it became NP No. 2626, their sole Class A-1 locomotive. The stability of the 4-8-4 wheel arrangement enabled it to be provided with driving wheels of up to 80 inches (2.0 m) diameter for high speed passenger and fast freight operation and, with the latest lateral control devices, the type was flexible on curves in spite of its eight-coupled drivers. The increased boiler size that became possible with this type, together with the high axle loads permitted on mainlines in North America, resulted in the design of some massive locomotives with all-up weights exceeding 350 tons with tender included. The 4-8-4 proved itself suitable for both express passenger and fast freight service. While it was not suited to heavy drag freight trains, faster and lighter trains were well suited to the type. The simplex 06 class by the Deutsche Reichsbahn in Germany. The simplex H class by the Victorian Railways in Australia. The compound 242A1 class of the Société nationale des chemins de fer français (SNCF) in France. An experimental high-pressure compound locomotive of the New York Central (NYC). Since the 4-8-4 was first used by the Northern Pacific Railway, the type was named "Northern". Most North American railroads used this name, but some adopted different names. "Big Apple" on the Central of Georgia Railway (CG). "Confederation" on the Canadian National Railway (CN), named because they were purchased in 1927, the 60th anniversary of Canada's confederation in 1867. The "Confederation" 4-8-4s were later renamed by the CN to the generic "Northern" name in later years. "Dixie" on the Nashville, Chattanooga and St. Louis Railway (NC). "Golden State" on the Southern Pacific Railroad (SP), temporarily renamed "General Service" during the Second World War and also referred to as "GS" by Western Pacific for those GSs which were diverted to the WP from SP's order by the War Production Board. "Greenbrier" on the Chesapeake and Ohio Railway (C&O). "J" on the Norfolk and Western Railway (N&W). "FEF" on the Union Pacific Railroad (UP). "Niagara" on the New York Central Railroad (NYC). "Niágara" on the Ferrocarriles Nacionales de México (N de M) and in Brazil. "Pocono" on the Delaware, Lackawanna and Western Railroad (Lackawanna). "Potomac" on the Western Maryland Railway (WM). "Western" on the Denver and Rio Grande Western Railroad (Rio Grande). "Wyoming" on the Lehigh Valley Railroad (LV). The Richmond, Fredericksburg and Potomac Railroad (RFP) gave each of its three 4-8-4 classes a separate name, the "General" of 1937, the "Governor" of 1938 and the "Statesman" of 1944. The big-wheeled 4-8-4 was at home on heavy passenger trains and quite capable of speeds over 100 miles per hour (160 kilometres per hour), but freight was the primary revenue source of the railroads; in that service the Northern had limitations. The adhesive weight on a 4-8-4 was limited to about 60% of the engine's weight, not including the dead weight of the tender. Henry Bowen, the Chief Mechanical Engineer of the Canadian Pacific Railway (CPR) from 1928 to 1949, tested the first two CPR K-1a Northerns introduced by his predecessor, then he designed a 2-10-4 Selkirk type using the same boiler. The resulting T-1a Selkirk locomotive had the same number of axles as the Northern, but the driving wheels were reduced from 75 to 63 inches (1,905 to 1,600 millimetres) in diameter, while the additional pair of driving wheels increased the tractive effort by 27%. In a later variant, Bowen added a booster to the trailing truck, enabling the Selkirk to exert nearly 50% more tractive effort than the similar-sized K-1a Northern. When it was demonstrated that a three-unit EMD F3 diesel-electric consist that weighed slightly less than the total engine and tender mass of a CPR K-1a Northern could produce nearly three times its tractive effort, Super Power steam locomotives were retired as quickly as finance allowed. A total of 23 4-8-4 locomotives operated in Australia, built to three distinct designs. In 1929, the ten 5 ft 3 in (1,600 mm) gauge South Australian Railways 500 class 4-8-2 Mountain types of 1926 were equipped with steam boosters in the form of small auxiliary steam engines to increase their power. This necessitated the replacement of their two-wheel trailing trucks with four-wheel bogies. The booster contributed an additional 8,000 pounds-force (36 kilonewtons) to the tractive effort and permitted an increase in the locomotive’s load across the Mount Lofty Ranges to 540 tons. In their new 4-8-4 configuration, they were reclassified to 500B class. In 1943, the first of twelve streamlined South Australian Railways 520 class locomotives were delivered from the Islington Workshops in Adelaide. Although they were large locomotives, they were designed to run on lightly constructed 60 pounds per yard (30 kilograms per metre) track, with the engine's weight being spread over eight axles. Their 66 inches (1,676 millimetres) diameter coupled wheels were specially balanced for 70 miles per hour (110 kilometres per hour) running. The H class three-cylinder 4-8-4 of the Victorian Railways, built in 1941, was designed for heavy passenger work on the line between Melbourne and Adelaide. Nicknamed Heavy Harry, it was the largest and second most powerful non-articulated steam locomotive built in Australia after the NSWGR D57 4-8-2 and was one of the four known classes of three-cylinder 4-8-4 locomotives. Construction of three locomotives commenced at the Newport Workshops in 1939 and three sets of frames were manufactured. Although work was halted due to the outbreak of the Second World War, a shortage of motive power caused by increased wartime traffic resulted in authorisation being given for the completion of class leader H220. The locomotive went into service on 7 February 1941, but remained the sole member of the class since the other two partly-built locomotives were never completed. Since the necessary upgrades to the Adelaide line was deferred, the H class operated only on the line between Melbourne and Albury in New South Wales. To meet the acute locomotive shortages in Brazil after the Second World War, 27 scaled down American 4-8-4 Niágara locomotives were ordered by the Brazilian Departamento Nacional de Estradas de Ferro (DNEF) from the American Locomotive Company (ALCO) in 1946. These locomotives were supplied to the Viação Férrea do Rio Grande do Sul (VFRGS), which then purchased another fifteen directly from ALCO in 1947. They were designated the 1001 class. In 1956 and 1957, some of them were sold to Bolivia. The Baldwin Locomotive Works supplied similar 1,000 mm (3 ft 3 3⁄8 in) metre gauge 4-8-4 locomotives to the Rede Mineira de Viação (RMV no. 601 to 604), the Rede de Viação Paraná-Santa Catarina (RVPSC no. 801 to 806) and the Noroeste do Brasil (NOB no. 621 to 623). After his retirement from the Société Nationale des Chemins de fer Français (SNCF) in France, French engineer André Chapelon was appointed as the chief designer of 1,000 mm (3 ft 3 3⁄8 in) metre gauge 4-8-4 locomotives at the French state-owned sales consortium Groupement d´Exportation de Locomotives en Sud-Amérique (GELSA). In 1949, a contract was signed between DNEF and GELSA for the construction of 24 4-8-4 locomotives with a 13 tonnes (12.8 long tons; 14.3 short tons) axle load. The order also included 66 2-8-4 Berkshires. All ninety locomotives were delivered by January 1953. The 24 class 242F Niágara locomotives were built by Société de Construction des Batignolles (Batignolles-Châtillon). They were two-cylinder simple expansion locomotives, designed to burn poor quality local coal with a low calorific thermal value, with coupled wheels of 60 inches (1,524 millimetres) diameter and a grate area of 58 square feet (5.4 square metres). They were coupled to big tenders which a coal capacity of 18 tonnes (17.7 long tons; 19.8 short tons). The Belpaire firebox included a combustion chamber and the boiler pressure was a high 18 standard atmospheres (1,800 kilopascals; 260 pounds per square inch). One member of the class was tested on the 1,000 mm (3 ft 3 3⁄8 in) metre gauge Reseau Breton line in France before being shipped to Brazil. The DNEF allocated the locomotives to four of Brazil's state railways. Under Brazilian railway conditions, these modern locomotives were not popular with local railwaymen and were not used as much as had been hoped. Their maximum axle load of 13 tonnes (12.8 long tons; 14.3 short tons) restricted their usefulness, as did their long tenders. In some places the turntables were too short to turn the locomotives and they had to be turned on triangles. In addition, the building specifications had called for a locomotive capable of a maximum speed of 80 kilometres per hour (50 miles per hour) and the ability to negotiate curves with a minimum radius of 80 metres (260 feet). This last point proved to be a source of contention when it was later discovered that the curves in some places were of less than 50 metres (160 feet) radius. As a consequence, the locomotives were involved in a number of derailments. In the late 1960s, they were relegated down from first class passenger trains. Some locomotives, allocated to Southern Brazil, were also tried in Bolivia. Since the Canadian mainlines were generally laid with 115-pound-per-yard (57 kg/m) rail, Canadian 4-8-4s were heavy and weighed in with axle loads up to 31.3 short tons (28.4 t). When the Canadian National Railway (CN) introduced its first 4-8-4 in 1927, it used the name "Confederation" for the type, to celebrate the 60th anniversary of the Canadian Confederation. The CN employed a total of 160 Confederation locomotives. Altogether forty locomotives were delivered in 1927, twenty Class U-2-a from the Canadian Locomotive Company and twenty Class U-2-b from the Montreal Locomotive Works (MLW). Another twenty Class U-2-c came from MLW in 1929 and another five Class U-2-d, also from MLW, in 1936. The CN U-4a was one of the few streamlined Confederation types, with five locomotives built by MLW and also introduced in 1936. U-4a No. 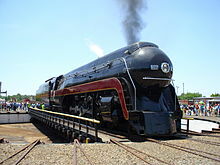 6400 achieved fame in 1939 by heading the Royal Train and being exhibited at the New York World's Fair in the same year. Between 1940 and 1944, a total of ninety more Confederation locomotives, built in four batches, were added to the CN roster. The Canadian Pacific Railway (CPR) experimented with the 4-8-4 wheel arrangement in 1928, when two K-1a class locomotives were built in its Angus shops in Montreal, the first locomotives to be built with a one-piece cast-steel frame in Canada. However, since the CPR mainlines were built to high standards, the railway preferred to develop the 4-6-4 Hudson type for passenger work since it gave adequate power and was cheaper to maintain, while a ten-coupled type, the 2-10-4 Selkirk, was adopted for heavy-duty work. Nevertheless, although the two CPR Northerns remained orphans, they proved their worth continuously for 25 years on overnight passenger trains between Montreal and Toronto. Before their retirement in 1960, they were converted to oil-burners and worked freight trains in the prairie provinces. In 1936, the German builder Henschel & Son supplied ten 5 ft 6 in (1,676 mm) gauge 4-8-4 locomotives to the Ferrocarriles del Estado (State Railways or FdE) of Chile, designated the Tipo 100. They were called Super Montañas (Super Mountains), since they followed the Tipo 80 4-8-2 Mountain that was introduced six years earlier. They were equipped with mechanical stokers and Vanderbilt tenders and weighed 185 tonnes in working order. On test, they produced 2,355 indicated horsepower (1,756 kilowatts) at a coal consumption of 34 kilograms per kilometre (120 pounds per mile) and a water consumption of 274 litres (60 imperial gallons; 72 US gallons) per kilometre. The design was not repeated, however, and the FdE returned to the 4-8-2 wheel arrangement with its subsequent acquisitions. The Tipo 100 was used on the line from Almeda to Talca until it was replaced by diesels in 1969. One of them, no. 1009, is preserved in the Santiago Railway Museum. In 1933, the Beijing–Hankou Railway in China needed new locomotives for their Guangzhou to Shaoguan line, where gradients of around two percent, curves with less than 250 metres (820 feet) radius and low capacity bridges existed. The requirement was therefore for a locomotive with high tractive effort and a low axle load. In 1935 and 1936, 24 600-series 4-8-4 locomotives, designed and built in the United Kingdom by Vulcan Foundry, were delivered to the railway. The locomotives represented a significant improvement over previous designs and incorporated a more efficient E-type superheater and duplex steam valve to allow better steaming without enlarging the boiler, while the 4-8-4 wheel arrangement allowed better weight distribution. When the Changsha-Guangzhou Railway was completed in October 1936, the locomotives were transferred to operate over the northern section between Hankou and Changsha on this new mainline, which connected Guangzhou with Tianjin and Peking. Following the establishment of the People's Republic of China, the locomotives were designated the China Railways KF class. Some of the locomotives survived in service until the early 1970s. One of them, no. 607, is preserved at the National Railway Museum in the United Kingdom. The lone 242A1 prototype of the Société Nationale des Chemins de fer Français (SNCF) was one of the four known classes of three-cylinder 4-8-4 locomotives. It also had the distinction, along with an experimental high pressure locomotive of the New York Central Railroad in the United States, of being one of the two compound 4-8-4s. It was rebuilt by Andre Chapelon from the unsuccessful 1932 three-cylinder 4-8-2 simple expansion locomotive no. 241.101 of the Chemins de Fer de l'État into a 4-8-4 compound locomotive. This remarkable locomotive achieved extraordinary power outputs and efficiency in coal and water consumption, but no further examples were built since the SNCF focused on electric traction for its future motive power development. The 242A1 was put through trials on many test runs which showed that this locomotive was equal in power output to the existing SNCF electric locomotives at the time. Here, for the first time in Europe, was a steam locomotive with a 20 tonnes (19.7 long tons; 22.0 short tons) axle load which was not only at least as powerful as the most powerful existing high-speed electric locomotive, but which could repeatedly achieve its maximum power without any mechanical trouble. Developing 5,300 indicated horsepower (4,000 kilowatts) and with 65,679 pounds-force (292 kilonewtons) of peak tractive effort and 46,225 pounds-force (206 kilonewtons) of mean tractive effort; nothing in Europe could match it. While the 242A1 was being tested, electrical engineers were designing the locomotives for the 512-kilometre long (318-mile) line between Paris and Lyon, which was to be electrified. An electric locomotive that was to be slightly more powerful than the successful Paris to Orléans 2-D-2 type electric locomotive was being contemplated. When the test results of the 242A1 became known, however, the design was hurriedly changed to incorporate the maximum capacity possible with a 23 tonnes (22.6 long tons; 25.4 short tons) axle load, resulting in the 144 tonnes (141.7 long tons; 158.7 short tons) 9100 class with a power output of more than 1,000 horsepower (750 kilowatts) more than that of the original design. The performances of the Mistral and other heavy passenger express trains would therefore not have been so outstanding if the 242A1 had not existed and Andre Chapelon therefore indirectly influenced French electric locomotive design. In addition, the 242A1 demonstrated the suitability of the Sauvage-Smith system of compounding for French conditions and the designs for future French steam locomotives that were prepared but never produced, were to make use of the Sauvage-Smith compounding system. In service, the 242A1 was allocated to the Le Mans depot and, between 1950 and 1960, it hauled express trains over the 411 kilometres (255 miles) between Le Mans and Brest. It did not remain in service long, however, and was withdrawn and scrapped in 1960. In 1939, the Deutsche Reichsbahn placed two prototype three-cylinder DRB Class 06 2D2-h3 heavy express locomotives in service, built by Krupp in 1938. Along with the lone 242A1 of the Société Nationale des Chemins de fer Français (SNCF) and the lone Victorian Railways H class in Australia, it was one of the four known classes of three-cylinder 4-8-4 locomotives. Due to the outbreak of the Second World War and construction problems, only the two locomotives were produced. With three 520 by 720 millimetres (20.47 by 28.35 inches) cylinders, large 2,000 millimetres (78.74 inches) diameter coupled wheels, a high 280 pounds per square inch (1,900 kilopascals) boiler pressure and 55,800 pounds-force (248 kilonewtons) of tractive effort, they were capable of a maximum speed of 140 kilometres per hour (87 miles per hour) and could haul a 650 tonne train at 120 kilometres per hour (75 miles per hour). Many parts, such as the boiler, were standardised with that of the DRG Class 45 heavy freight locomotive. The streamlined Class 06, the only German 4-8-4, was the biggest steam locomotive ever built in Germany. The two locomotives were shedded in Frankfurt and were placed in service on the line to Erfurt. No. 06.002 was bombed and destroyed during the hostilities and no. 06.001 survived until 1951, when it was retired and scrapped. The boiler of both the 06 and 45 were designed along the lines of Robert Garbe and Richard Paul „Kunibald“ Wagner, who held that a combustion chamber or double-expansion compound steam engines were unnecessary when using superheated steam. 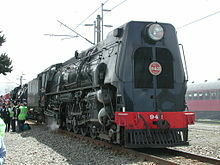 While the DB railways in the FRG salvaged the Class 45 design by fitting it with a badly-needed mechanical stoker, there was no need for the powerful Class 06 Express locos; when express traffic resumed, DB Class V 200 and DB Class E 10 Diesel-hydraulic and AC electric engines made any investment into pre-World War II steam engines unacceptable for the DB leadership even though Friedrich Witte or Adolph Giesl-Gieslingen proposed many improvements. In 1946, the Ferrocarriles Nacionales de México (N de M) placed orders with American Locomotive Company and Baldwin Locomotive Works for sixty Niágara locomotives for use on its principal express passenger services on upgraded lines, but the order was reduced to 32 in favour of diesel-electric locomotives. These QR-1 class locomotives were used mainly on lines north of Mexico City and were nicknamed La Maquina. All were taken out of service in the late 1960s. No. 3028 survives, although not in operating condition, stored on the deadline at the New Hope and Ivyland Railroad in New Hope, Pennsylvania. New Zealand adopted the narrow 3 ft 6 in (1,067 mm) gauge to minimise railway construction costs and, due to the mountainous terrain, the loading gauge was restricted to a maximum height of 11 feet 6 inches (3.51 metres) and width of 8 feet 6 inches (2.59 metres), making it one of the most restrictive loading gauges in the world. While this undoubtedly reduced the cost of building the two hundred-odd tunnels on the railway system, it posed major problems for locomotive designers which were exacerbated by an axle load limit of 14 long tons (15.7 short tons; 14.2 tonnes). After the Soviet Union and South Africa, the New Zealand Railways Department (NZR) had the largest fleet of 4-8-4 locomotives outside North America, with 71 similar locomotives in the K class, KA class and KB class. The K class was designed by R.J. Gard to the requirements of Locomotive Superintendent P.R. Angus and was built locally at the Hutt Workshops of the NZR. The first locomotives were delivered during the depths of the Great Depression in 1932. The 47 square feet (4.4 square metres) grate and comparatively large boiler was slung low on a narrow frame to keep within the height restrictions, and width restrictions were adhered to with sloped cab sides and the mounting of two single stage air compressors in front of the smokebox. After the construction of thirty K class locomotives, the NZR developed the design to strengthen the frame and introduced other improvements, such as roller bearings on all axles and ACFI (Accessoires pour les Chemins de Fer et l'Industrie) feedwater heaters. Introduced from 1939, they were also built in NZR workshops, most of them with streamlined shrouding to cover the external pipe work of their feedwater heater systems. The first 35 locomotives were designated KA class and worked on the North Island mainlines with the older K class locomotives. Six more were built, designated KB class, for service on the steeply graded Midland line on the South Island. These locomotives were equipped with trailing truck boosters, which raised their tractive effort by 6,000 pounds-force (27,000 newtons). On occasion, these 4-8-4s recorded speeds up to 75 miles per hour (121 kilometres per hour). The streamlining shrouds of the KA and KB classes were removed in the late 1940s when the ACFI feedwater heaters were replaced with exhaust steam injectors. The last of these locomotives was withdrawn in 1968 due to dieselisation. Seven have been preserved, K class numbers 900, 911 and 917, KA class numbers 935, 942 and 945 and KB class no. 968. Between 1953 and 1955, the South African Railways (SAR) placed fifty Class 25NC 4-8-4 Northern locomotives in service. Designed under the direction of Chief Mechanical Engineer L.C. Grubb, eleven of these locomotives were built by North British Locomotive Company (NBL) and 39 by Henschel & Son. They were tended by Type EW1 tenders which rode on six-wheeled bogies. Two versions of the same locomotive were built, the Class 25NC being the non-condensing version, hence the "NC" suffix to the class number. Ninety Class 25 condensing locomotives were introduced simultaneously, acquired as a means to deal with the shortage of adequate supplies of suitable locomotive water in the arid Karoo. The design work on the engine’s condensing apparatus and the enormous condensing tender was carried out by Henschel, who built one locomotive complete with tender as well as sixty of the condensing tenders, to which they held the patent. The other 89 condensing locomotives and thirty tenders were built by NBL. The Type CZ condensing tenders were slightly longer than their engines. One-third of the total length of the tender was taken up by the water tank and coal bunker, while the rest was taken up by eight large radiators on each side, cooled by five steam-driven roof-mounted fans. Roller bearings were used throughout on all these locomotives, including the coupling and connecting rods, the crosshead gudgeon pins as well as the three-axle bogies of both the standard and condensing tenders. The leading bogies and coupled wheels had Cannon-type axle boxes. The cylinders and frames were cast in one piece, while the steel cylinders and steam chests were fitted with cast iron liners. The tender frames of both locomotive types were also one-piece steel water-bottom castings. Since they were entirely mounted on roller bearings, very little effort was required to move these big locomotives. On the condensing locomotives, spent steam was recycled and condensed back to water for repeated use. Since the steam was not expelled up the chimney, the smokebox contained a steam turbine-driven fan beneath the chimney to keep the draught going. Visual evidence of this altered and slightly longer smokebox is the locomotive’s banjo-face smokebox front. The condensing system proved extremely efficient and reduced water consumption by as much as 90% by using the same water up to eight times over, which gave the Class 25 a range of 800 kilometres (500 miles) between water refills. In addition, the hot condensate feedwater resulted in significantly reduced coal consumption. However, the Class 25 was a complex locomotive that required high maintenance, especially on the turbine blower fans in the smokebox, whose blades needed to be replaced frequently due to damage by solid particles in the exhaust. The equally complex condensing tender also required frequent maintenance. Between 1973 and 1980, partly motivated by the spread of electric and diesel-electric traction, all but three of the locomotives were converted to free-exhausting and non-condensing locomotives and reclassified to Class 25NC. In the process their condensing tenders were also rebuilt to ordinary coal-and-water tenders by removing the condensing radiators and roof fans and replacing it with a massive round-topped water tank. Since the tenders were built on single cast-steel main frames, it was impractical to attempt to shorten them. Locomotives with these rebuilt Type EW2 tenders were soon nicknamed Worshond (Sausage dog or Dachshund). The Class 26, popularly known as the Red Devil, was rebuilt from Henschel-built Class 25NC no. 3450 by mechanical engineer David Wardale. The rebuilding took place at the Salt River shops of the SAR in Cape Town and was based on the principles developed by Argentinian mechanical engineer Livio Dante Porta. The primary objectives of the modifications were to improve the combustion and steaming rate to reduce the emission of wasteful black smoke and to overcome the problem of clinkering. This was achieved by the use of a Gas Producer Combustion System (GPCS), which relies on the gasification of coal on a low temperature firebed so that the gases are then fully burnt above the firebed. The GPCS minimises the amount of air being drawn up through the firebed, the main source of air required for combustion being through ancillary air intakes located on the firebox sides above the firebed. The modified locomotive became the only Class 26. Compared to an unmodified Class 25NC, the Red Devil achieved a 28% measured saving on coal and a 30% measured saving on water, measured during freight service, and a 43% increase in drawbar power based on the maximum recorded drawbar power. Its approximate maximum range in full load freight service on 1% to 1¼% grades was 700 kilometres (430 miles) based on its coal capacity, and 230 kilometres (140 miles) based on its water capacity. The maximum recorded freight load hauled relative to gradient was 900 tonnes (890 long tons; 990 short tons) on 2% grades, and it could haul a 650 tonnes (640 long tons; 720 short tons) passenger train at a constant speed of 100 kilometres per hour (62 miles per hour) on 1% grades. The Red Devil’s great power, however, also turned out to be its one weakness. The Class 25NC had already proven to be on the slippery side and the much more powerful Class 26, with essentially still the same dimensions as the Class 25NC, was even worse. It was a poor performer at starting or at low speeds on steep gradients. 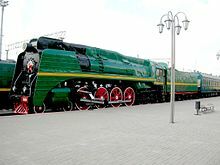 Outside North America, the largest fleet of 4-8-4 locomotives was the Class P36 of the Sovetskie Zheleznye Dorogi (SZhD) or Soviet Railways), of which 251 were built by the Kolomna locomotive works between 1949 and 1956. 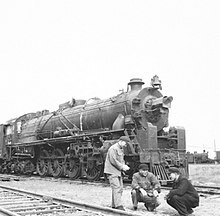 As the last Soviet standard class steam locomotive, the Class P36 shared some common components and design attributes with earlier standard Soviet designs such as the L class 2-10-0 Decapod type and LV class 2-10-2 Santa Fe type, as well as some common attributes with the P34 class 2-6-6-2 Mallet and P38 class 2-8-8-4 Yellowstone type Mallet. For example, the P36 and LV classes shared the same feedwater heater, made by the Bryansk machine factory. Apart from a trio of fully streamlined 4-6-4 Baltic type locomotives, they were the only semi-streamlined steam locomotives built in Russia. The Class P36 was one of the best passenger steam locomotive classes built in the Soviet Union. They had boilers with 243.2 square metres (2,618 square feet) of heating surface that had a working boiler pressure of 1.5 megapascals (220 pounds per square inch). Russian-designed roller bearings were fitted throughout and the boilers were designed to provide a continuous steaming capacity of 57 kilograms (126 pounds) per one square metre (11 square feet) of heating surface in the boiler. With its 575 by 800 millimetres (22.6 by 31.5 inches) cylinders and 1,850 millimetres (72.83 inches) diameter coupled wheels, it could easily attain speeds up to 125 kilometres per hour (78 miles per hour) with passenger trains of up to 800 tonnes (790 long tons; 880 short tons). The Class P36 first appeared on the Oktyabrskaya Railway (October Railway) to haul principal express trains between Moscow and Leningrad, but they did not remain on this 650 kilometres (400 miles) mainline long. Diesels took over after only a few years and the P36 class locomotives were transferred to other lines and depots, such as the Moscow–Kursk and Moscow–Ryazan lines, Kalinin, Krasnoyarsk, Belarusian Railway, Melitopol depot, Kuibyshev and Alexandrov depot. Later, when electrification and dieselisation expanded, many of the Class P36 locomotives were transferred to work on the Lviv, Far East, Eastern Siberia, and Transbaikal Railways. The last was withdrawn from regular scheduled express passenger train service in 1974. All were staged in full working order and kept in reserve for times of extraordinary demand. At certain intervals, the locomotives were taken out from staging, steamed up and put to work to haul trains to test the condition of the locomotives. In the late 1980s, these strategic reserves of locomotives were disbanded and the Class P36 locomotives were distributed to museums and for preservation. Some that had not seen regular use for more than fifteen years and were in the worst mechanical condition, were scrapped. It was found that the roller bearings suffered most by standing unused. When the computerised new class numbers were introduced by the Russian Ministry of Railways, the Class P36 were designated Class 1000.0001 to 1000.0251. In the 1990s, after the collapse of the Soviet Union, a number were sold to private train operators. The 242F class express passenger 4-8-4 locomotives were designed by the Red Nacional de los Ferrocarriles Españoles (RENFE) in 1955 and were remarkably well-proportioned. Developed from a preceding 4-8-2 Mountain type, they had improved steam passages and developed 30 to 40 per cent more power at medium cut-offs and high speed. Ten of these locomotives were built by La Maquinista Terrestre y Maritima SA in Barcelona to burn fuel oil. They had Witte type smoke deflectors and were fitted with a double KylChap (Kylälä-Chapelon) blast-pipe, a Worthington feedwater heater and a Traitement Integral Armand (TIA) water-softening device. To increase the comfort of the locomotive crew, the cabs had wooden floors mounted on springs, and the seats of the driver and fireman were also sprung, a very welcome improvement for long runs on poor tracks. These locomotives were painted in a green livery when turned out from the builder's works at Barcelona and were consequently nicknamed Los Verdes (The Greens). The 242F class was the fastest Spanish steam locomotive. When tested on the line from Barcelona to Tarragona across 10.4 miles (16.7 kilometres) of practically level and straight line between Vilanova i la Geltrú and San Vincente, a speed exceeding 84 miles per hour (135 kilometres per hour) was sustained twice, first with a train of 430 tons and then with a train of 480 tons. High-capacity tests took place between Madrid and Ávila when a train weighing 426 tons, including a dynamometer car, was hauled at sustained speeds of 70.3 miles per hour (113.1 kilometres per hour) up a gradient of 0.35% (1 in 286), 57.2 miles per hour (92.1 kilometres per hour) up a gradient of 1.05% (1 in 95) and 39.1 miles per hour (62.9 kilometres per hour) up a gradient of 2¼% (1 in 44.5). The gross horsepower figures recorded with the dynamometer car were 1790, 2350 and 2320 respectively, the calculated horsepower on the rail being 2600, 3400 and 3580. The latter output translates to about 4,000 indicated horsepower (3,000 kilowatts). With these locomotives, there was some concern about water supply. The capacity of the tender was limited at only 6,200 imperial gallons (28,000 litres) and, with few watering points in service, the full capacity of the locomotive was not always used for fear of running short of this essential commodity in the semi-arid Spanish landscape. For example, for the 163-kilometre long (101-mile) stretch between Medina del Campo and Burgos that rises 131 metres (430 feet) with an uphill start, three intermediate stops, one slack and some shunting movements to couple extra coaches to the train, the amount of water consumed was about 7,300 imperial gallons (33,000 litres). All ten locomotives were allocated to the Miranda de Ebro shed to haul principal heavy express trains. In the 1960s, they were a familiar sight at the head of the premier express trains, but in 1971 they were transferred entirely to semi-fast passenger trains and even to the haulage of heavy seasonal fruit trains between Castejón and Alsasua from October to January. One locomotive, no. 242F.2009, is preserved at the Madrid Railway Museum. The American 4-8-4 was a heavy locomotive, with nearly all examples in the United States having axle loads of more than 30 short tons (27 tonnes). On railroads with rail of 130 to 133 pounds per yard (64 to 66 kilograms per metre), axle loads of more than 36 short tons (33 tonnes) were permitted. Exceptionally heavy Northerns were therefore introduced on the Atchison, Topeka and Santa Fe (Santa Fe), Chicago and North Western (CNW), Chesapeake and Ohio (C&O), Milwaukee Road, Northern Pacific (NP), Norfolk and Western (N&W), Spokane, Portland and Seattle (SP&S) and Western Maryland (WM) railroads. The preserved SP&S no. 700 is a surviving example of the three SP&S Class E-1 locomotives, which had the heaviest axle load of all at 37.1 short tons (33.7 tonnes). The lightest Northerns in the United States were the six H-10 class locomotives of the Toledo, Peoria and Western (TPW), with an axle load of 23 short tons (21 tonnes). Some Northerns were used on exceptionally long runs. The Santa Fe Northerns were rostered to haul the Chief and Fast Mail trains between La Junta, Colorado and Los Angeles across 1,255 miles (2,020 kilometres), and also handled the Grand Canyon Limited between Los Angeles and Wellington, Kansas, across 1,534 miles (2,469 kilometres). From 1942, they ran through from Los Angeles to Kansas City via the Belen Cutoff and Amarillo, Texas, a distance of 1,789 miles (2,879 kilometres), setting a new record for through steam locomotive rosters. The Niagaras of the New York Central Railroad (NYC) also accomplished long runs on New York to Chicago passenger trains, including the Chicagoan and the Commodore Vanderbilt. Northern Pacific 4-8-4s hauled the North Coast Limited across 1,008 miles (1,622 kilometres) from St. Paul, Minnesota, to Livingston, Montana. Several of the earlier 4-8-4 locomotive models were modified or rebuilt during their service lives. Santa Fe developed their Northerns for years, and named the classes based on the number of the first locomotive in the class. The fourteen 3751 class locomotives that were introduced in 1927 and 1928 were of conservative design, with 73 inches (1,854 millimetres) diameter driving wheels and a boiler pressure of 210 pounds per square inch (1,400 kilopascals). In 1938, these locomotives were rebuilt with more modern features, including new 80 inches (2,032 millimetres) diameter Boxpok driving wheels, increased size steam passages to and from the cylinders, the boiler pressure raised to 230 pounds per square inch (1,600 kilopascals) and roller bearings on all engine axles. This gave them a maximum drawbar power of 3,600 horsepower (2,700 kilowatts) at 50 miles per hour (80 kilometres per hour). Engine no. 3752 was equipped with Franklin rotary cam poppet valve gear and achieved the very low steam rate of 13.5 lb per indicated horsepower-hour (2.28 mg/J). These locomotives were permitted to run at 90 miles per hour (140 kilometres per hour), but they were alleged to have exceeded 100 miles per hour (160 kilometres per hour) several times. The heavy Class H Northerns of the Chicago and Northwestern Railroad were rebuilt in 1940 with lightweight rods, Boxpok driving wheels and roller bearings on all axles, and the boiler pressure was raised from 250 to 275 pounds per square inch (1,720 to 1,900 kilopascals). Some years later, 24 of them underwent another rebuild which included new nickel-steel frames, new cylinders, pilot beams and air reservoirs, new fireboxes and other minor improvements. These were reclassified as Class H-1. Some Northern locomotives were also rebuilt from older engines. Between 1945 and 1947, the Reading Railroad rebuilt thirty of their heavy I-10 class 2-8-0 Consolidations to booster-fitted 4-8-4 Northern locomotives with 70 inches (1,778 millimetres) diameter driving wheels. An additional ring was added at the smokebox end of the boiler, which increased the length of the boiler tubes from 13 feet 6 inches (4.11 metres) to 20 feet (6.1 metres), and a larger smokebox was installed which increased the distance between the tube plate and the chimney centre line from 34 inches (0.86 metres) to 111 inches (2.8 metres). Steam pressure was raised from 220 to 240 pounds per square inch (1,500 to 1,700 kilopascals). Four syphons were fitted, three in the firebox proper and one in the combustion chamber. A twelve-wheeled tender was attached, weighing 167 tons in working order, with a capacity of 23.5 tons of coal and 19,000 US gallons (72,000 litres) of water. A new cast-steel frame was used, with the cylinders cast integral and roller bearings on all axles. They were reclassified to T1 and numbered 2100 to 2129. Two of these locomotives, preserved for hauling special trains, were still in use in 1963. The Northerns were workhorses that went without much public recognition, with a few exceptions. 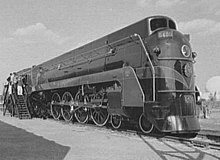 The Class GS-4 Golden State locomotives of Southern Pacific (SP), of which 36 were built by Lima Locomotive Works in 1941 and 1942, were semi-streamlined and were given a striking livery with a broad orange valence over the wheels below a narrow red band that came halfway up the cab windows. The locomotives headed the Coast Daylight train on the railroad's Coast Line between Los Angeles and San Francisco. The television program The Adventures of Superman was introduced with a shot of an SP GS-4 as the announcer declared that Superman was "more powerful than a locomotive." One of them, GS-4 no. 4449, has been restored and is in operating condition. Even after the demise of steam, the Northern type has been in the spotlight of publicity and, along with Union Pacific no. 844 of the Union Pacific FEF Series, have been the favoured type to provide mainline excursions in the United States. The latter is the only steam locomotive of a Class I railroad never to have been retired. Most North American 4-8-4s were built by ALCO, Lima and the Baldwin Locomotive Works, while Canadian National Railway's fleet was built by Montreal Locomotive Works. Only the Canadian Pacific Railway, the Norfolk and Western Railway, the St. Louis Southwestern Railway (Cotton Belt) and the Reading Railroad built their own. The Missouri Pacific rebuilt one class of their 4-8-4s from their class BK-63 2-8-4s. The Northern type was used by 37 railroads in the Americas, including 31 railroads in the United States, three in Canada, one in Mexico and two in Brazil. In all, there were fewer than 1,200 locomotives of this type in North America, compared to the approximately 2,500 4-8-2 Mountain types and 6,800 4-6-2 Pacific types. By far the largest fleet was owned by the CN and its subsidiary, the Grand Trunk Western Railroad, with altogether 203 locomotives. Northern Pacific Railway (48 "Northerns") A 2600–2611 Alco 1926 All scrapped. A-1 2626 Alco 1930 ex-Timken 1111. Scrapped, but SP&S 700 is well known for looking very identical to the class. A-2 2650–2659 Baldwin 1934 Scrapped, but SP&S 700 is well known for looking very identical to the class. A-3 2660–2667 Baldwin 1938 Scrapped, but SP&S 700 is well known for looking very identical to the class. A-4 2670–2677 Baldwin 1941 Scrapped, but SP&S 700 is well known for looking very identical to the class. A-5 2680–2689 Baldwin 1943 Scrapped, but SP&S 700 is well known for looking very identical to the class. 2900 2900–2929 Baldwin 1943–1944 2903, 12, 13, 21, 25, 26, and 29 preserved. (55 "Poconos") Q-1 1501–1505 Alco 1927 All scrapped. Q-2 1601–1620 Alco 1929 All scrapped. Q-3 1621–1630 Alco 1932 All scrapped. Q-4 1631–1650 Alco 1934 All scrapped. (2 "Northerns") K1a 3100–3101 CP (Angus) 1928 Both examples preserved. Chicago and North Western Railway (35 "Northerns") H 3001–3035 Baldwin 1929 24 rebuilt to H-1, all later scrapped. (85 "Northerns") R-67 5000–5064 Alco 1929–1930 All scrapped. R-67 5100–5119 Alco 1944, 1946 All scrapped. (19 "Westerns") M-64 1700–1713 Baldwin 1929 All scrapped. M-68 1800–1804 Baldwin 1938 All scrapped. (38 "Northerns") S-1 2550–2555 Baldwin 1929 All scrapped. S-2 2575–2588 Baldwin 1930 2584 preserved. (36 “Northerns”) O-5 5600–5607 Baldwin 1930 All scrapped. O-5a 5608–5635 CB&Q 1936–1940 Many preserved including 5614 and 5629, 31, and 33. S-1 251 MILW 1938 Scrapped. S-2 201–240 Baldwin 1937, 1940 Scrapped. (25 "Dixies") J-2 565–569 Alco 1930 Scrapped. J-3 570–589 Alco 1942 576 under restoration by the Nashville Steam Preservation Society in Centennial Park in Nashville, Tennessee; and the only surviving 4-8-4 that worked for Nashville, Chattanooga and St. Louis Railroad. (20 "Northerns") L1 800–809 Baldwin 1930 Scrapped. L1 810–819 SSW 1937, 1942–1943 819 is the youngest and only surviving Class L1 Northern and under restoration at the Arkansas Railroad Museum in Pine Bluff, Arkansas. (70 "Golden States" or “General Service”) GS-1 4400–4409 Baldwin 1930 Scrapped. GS-2 4410–4415 Lima 1936 Scrapped. GS-3 4416–4429 Lima 1937 Scrapped. GS-5 4458–4459 Lima 1942 Essentially 2 experimental GS-4 locomotives fit with roller bearings. Scrapped. GS-6 4460–4469 Lima 1943 4460 is the oldest and only surviving GS-6 and the last GS Class 4-8-4 built today displayed at the Museum of Transportation in Kirkwood next to St. Louis, Missouri. (4 "Golden States") GS-1 700–703 Baldwin 1930 Scrapped. (25 "Northerns") O-1 2900–2924 Baldwin 1930–1931 Scrapped. (37 "Wyomings") T-1a 5100–5110 Baldwin 1931–1932 Scrapped. T-2a 5200–5210 Alco 1931–1932 Scrapped. T-2b 5211–5220 Alco 1943 Scrapped. T-3 5125–5129 Baldwin 1934–1935 Scrapped. (28 "Niagaras") HS-1a 800 Alco 1931 Experimental prototype. Deemed a failure and spent the rest of its career as a switcher locomotive. S-1a 6000 Alco 1945 Scrapped. S-1b 6001–6025 Alco 1945–1946 Scrapped. S-2a 5500 Alco 1946 Fit wit poppet valves. Scrapped. (15 "Greenbriers") J-3 600–606 Lima 1935, 1942 Scrapped. Ontario Northland Railway (5 "Northerns") 1100 1100–1104 CLC 1936 Scrapped. Atlantic Coast Line Railroad (12 "1800s") R-1 1800–1811 Baldwin 1938 Scrapped. Richmond, Fredericksburg and Potomac Railroad (27, names by class below) Generals 551–555 Baldwin 1937 Scrapped. Governors 601–612 Baldwin 1938, 1942 Scrapped. Statesmen 613–622 Baldwin 1944–1945 Scrapped. Toledo, Peoria and Western Railway (6 "Northerns") H-10 80–85 Alco 1937 Scrapped. (45 “Northerns” or "Four-Eight-Fours"/“FEFs”) FEF-1 800–819 Alco 1937 814 preserved in Council Bluffs, IA. FEF-2 820–834 Alco 1939 833 preserved in Ogden, UT. FEF-3 835–844 Alco 1944 844 Is the oldest operating steam engine on a Class One Railroad and is used as an excursion locomotive. Wisconsin Central Railway (4 "Northerns") O-20 5000–5003 Lima 1938 Scrapped. N-73 2201–2215 Baldwin 1943 Scrapped. Wartime restrictions prohibited the MP from designing their own Northern. This class was based on the D&RGW “1800s” design. Norfolk and Western Railway (14 "J"s) J 600–613 N&W 1941–1950 611 has been restored and returned to revenue service for excursions in the summer of 2015. Central of Georgia Railway (8 "Big Apples") K 451–458 Lima 1943 Scrapped. Delaware and Hudson Railroad (15 "Northerns") K-62 300–314 Alco 1943 Scrapped. St. Louis – San Francisco Railway (25 "Northerns") 4500 4500-4524 Baldwin 1942–1943 4500, 01, and others preserved. (6 "Northerns") GS-64 481–486 Lima 1943 Built to SP GS-6 specifications due to WPB restrictions. Baldwin (16) 1946 Several of both classes preseved after sitting in scrap lines through the 1960s. Western Maryland Railway (12 "Potomacs") J-1 1401–1412 Baldwin 1947 Scrapped. In many countries, the 4-8-4 was a late development of the steam locomotive, close to the time of steam's demise. Many more were therefore preserved than of other older wheel arrangements, either plinthed or in museums, with several being kept in running condition. Some of the more notable preserved Northerns worldwide are listed here by country of origin. South Australian Railways 504: In static preservation at the National Railway Museum, Port Adelaide. South Australian Railways 520: Restored to service in 1972, operating the SteamRanger tourist railway between Mount Barker and Victor Harbor at the time. South Australian Railways 523: In static preservation at the National Railway Museum, Port Adelaide. Victorian Railways H class H 220: In static preservation at the Australian Railway Historical Society Museum in Newport, Victoria, this locomotive is the only surviving three cylinder example of a 4-8-4. CN 6153: On static display at the Canadian Railway Museum in Delson, Quebec. CN 6167: On static display in downtown Guelph, Ontario. CN 6200: Canadian Science & Technology Museum, Ottawa, Ontario. CN 6213: On static display in downtown Toronto, Ontario, at the Toronto Railway Heritage Centre. CN 6218: Fort Erie Railroad Museum, Fort Erie, Ontario. Used by the CN on excursions in the 1960s and 1970s. CN 6400: Canadian Science & Technology Museum, Ottawa, Ontario. CP 3100: Canadian Science & Technology Museum, Ottawa, Ontario. CP 3101: On display at EVRAZ (formerly IPSCO Steel), Regina, Saskatchewan. GTW 6323: On display at the Illinois Railway Museum in Union, Illinois. GTW 6325: Restored in 2001 by the Ohio Central Railroad, owned by Age of Steam Roundhouse, Sugarcreek, Ohio. Currently, the locomotive is in need of valve and running gear work. Class KF1 006: Displayed at the China Railway Museum, Beijing. Class KF 7: Displayed at the National Railway Museum, York, UK. N de M 3027: Guadalajara, Jalisco. N de M 3028: Retired in 1966, acquired by the Great North Eastern Railroad Foundation and displayed at the Altamont, New York, fairgrounds until 1983. On lease to the New Hope and Ivyland Railroad. N de M 3030: Zacatecas, Zacatecas. N de M 3031: Huehuetoca, Mexico. N de M 3033: Pachuca, Hidalgo. N de M 3034: Puebla, Puebla. N de M 3035: Aguascalientes, Aguascalientes. N de M 3036: Leon, Guanajuato. N de M 3038: Mexico City. N de M 3039: Monterrey, Nuevo Leon. N de M 3040: Oriental, Puebla. N de M 3056: Tequisuiapan, Queretaro. K 900: On static display at MOTAT in Auckland next to New Zealand DA class locomotive No. 1400. K 911: Under overhaul at Mainline Steam, Plimmerton, Wellington. K 917: Stored, missing many parts, Steam Incorporated, Paekakariki, Wellington. KA 935: Awaiting overhaul at the Silver Stream Railway, near Wellington, New Zealand. KA 942: In service at Mainline Steam, Plimmerton, Wellington, was used on mainline excursions. KA 945: Stored in dismantled condition at Steam Incorporated, Wellington. KB 968: Owned by Canterbury Railway Society, leased to Mainline Steam. Under overhaul at Mainline Steam, Christchurch. Class 25 3511: Condenser, staged at Beaconsfield, Kimberley. Class 25NC 3405: Displayed at the Buckinghamshire Railway Centre, Quainton, UK. Class 25NC 3432: Stored at Mainline Steam, Auckland, New Zealand. Class 25NC 3437: Owned by Steamnet 2000, restored and steamed in April 2017. Class 25NC 3442: Operated by Rovos Rail, Capital Park, Pretoria. Class 25NC 3454: Ex condenser with dual Lempor exhaust, staged at Bloemfontein. Class 25NC 3484: Ex condenser, operated by Rovos Rail, Capital Park, Pretoria. Class 25NC 3508: Stored at Mainline Steam, Auckland, New Zealand. Class 25NC 3533: Ex condenser, operated by Rovos Rail, Capital Park, Pretoria. Class 26 3450: The Red Devil, staged at Monument Station, Cape Town. P36-0001: Restored to working order at Roslavl in 2005. Currently displayed at Rizhsky Station, Moscow. P36-0027: Tikhoretsk for restoration to working order. P36-0031: Troitsk in working order. P36-0032: The only private steam locomotive operated in Russia, owned by GW Travel. P36-0064: Brest Railway Museum, Belarus Railways. P36-0071: Cosmetically restored and on display in Nizhny Novgorod. P36-0120: Now restored to working order at Tikhoretsk. Returned to Moscow 03/09/13 for the '1520 Railway Exhibition' at Scherbinka. Currently based in Moscow. P36-0123: Prora Museum, Ruegen Island, Germany. P36-0182: Cosmetically restored and on display in Chelyabinsk. P36-0218: Tikhoretsk/Bataysk, restored to working order. P36-0228: Uulan Baatar Railway Museum, Mongolia. P36-0232: Cosmetically restored at Zlatoust in 2009 for display in Samara. May display a different number. P36-0249: Shushary Railway Museum, St. Petersburg. P36-0250: Tashkent Railway Museum, Uzbekistan. P36-0251: Warsaw Station Museum, St. Petersburg. RENFE242F-2009: Retired in 1973, restored in 1989 and another time in 2005. Although she is in running order, usually is in static display at the Museo del Ferrocarril, housed in the former Delicias Railway Station. Atchison, Topeka & Santa Fe 2903: Illinois Railway Museum, Union, Illinois. Atchison, Topeka & Santa Fe 2912: On static display in Pueblo, Colorado, awaiting cosmetic restoration. Atchison, Topeka & Santa Fe 2913: On static display in Fort Madison, Iowa. Atchison, Topeka & Santa Fe 2921: Beard Brook Park, Modesto, California. Atchison, Topeka & Santa Fe 2925: California State Railroad Museum, Sacramento, California. Atchison, Topeka & Santa Fe 2926: Currently under restoration for excursion service in Albuquerque at a site leased from the GSA near 8th Street and Haynes Avenue, due to be completed in 2015 and may be available for tour and close inspection. More information at New Mexico Steam Locomotive and Railroad Historical Society. Atchison, Topeka & Santa Fe 3751: Restored in 1991, owned by the San Bernardino Railroad Historical Society and is operated in excursion service. It is the oldest surviving 4-8-4, the first one to be built by the Baldwin Locomotive Works and the first 4-8-4 to be built for the Santa Fe. Atchison, Topeka & Santa Fe 3759: On Display in Kingman, Arizona. Atchison, Topeka & Santa Fe 3768: On display at the Great Plains Transportation Museum in Wichita, Kansas. Chesapeake & Ohio 614: Restored in 1980 and again in 1995, owned by Iron Horse Enterprise, Clifton Forge, Virginia. Chicago, Burlington and Quincy Railroad 5614: Patee Park, St. Joseph, Missouri. Chicago, Burlington and Quincy Railroad 5629: Colorado Railroad Museum, Golden, Colorado. Chicago, Burlington and Quincy Railroad 5631: Rotary Park, Sheridan, Wyoming. Chicago, Burlington and Quincy Railroad 5633: Douglas Railroad Interpretive Center, Douglas, Wyoming. Grand Trunk Western 6323: Illinois Railway Museum in Union, Illinois. Great Northern Railway S-2 No.2584: On display at the Havre, Montana depot. Milwaukee Road 261: Restored in 1993, owned, maintained, and operated by the Friends of the 261 in Minneapolis, Minnesota. Milwaukee Road 265: Illinois Railway Museum in Union, Illinois. Nashville, Chattanooga, & St. Louis 576 Centennial Park, Nashville, Tennessee. On 23 May 2015, N&W #611 sits on the turntable at the North Carolina Transportation Museum during 2015 restoration. Ran frequent excursions in the 1980s and early 1990s, then placed on static display at the Virginia Museum of Transportation, Roanoke, Virginia. Second restoration to operational condition completed June 2015 at the North Carolina Transportation Museum, Spencer, North Carolina. Reading 2100: Restored in 1988 and 1998, converted to burn oil in the Early 2000s. On long-term lease to the American Steam Railroad. Currently being moved to Cleveland, Ohio for restoration. Reading 2101: B&O Railroad Museum, Baltimore, Maryland. Reading 2102: Reading & Northern Railroad, Port Clinton, Pennsylvania. Reading 2124: Used on the "Reading Rambles" in the late 1950s and 1960s. On static display at Steamtown National Historic Site in Scranton, Pennsylvania. Built in 1943, it was the last locomotive built by the Cotton Belt. Restored to service in 1986 and housed at the Arkansas Railroad Museum in Pine Bluff, Arkansas. St. Louis-San Francisco 4500: As the Frisco Meteor, ran overnight passenger service between St. Louis, Tulsa and Oklahoma City. Cosmetically restored and relocated in 2011 to the Route 66 Historical Village at 3770 Southwest Blvd in Tulsa, Oklahoma. St. Louis-San Francisco Railway 4501: Built in 1942, ran overnight passenger service as the Frisco Meteor between St. Louis, Tulsa, and Oklahoma City. Donated to the Dallas Museum of the American Railroad in September 1964. St. Louis-San Francisco Railway 4516: Missouri State Fairgrounds, Sedalia, Missouri. St. Louis-San Francisco Railway 4524: Grant Beach Park, Springfield, Missouri. 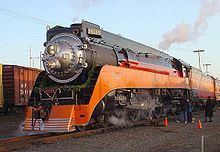 Spokane, Portland and Seattle 700: Restored in 1990 by the Oregon Rail Heritage Foundation, and is operated in excursion service. No. 700 is stored at the Oregon Rail Heritage Center in Portland, Oregon, along with SP 4449. Southern Pacific 4449: Still in operation, served as the locomotive for the Bicentennial American Freedom Train. Stored at the Oregon Rail Heritage Center in Portland, Oregon along with SPS 700. Southern Pacific 4460: On static display at the Museum of Transportation in St. Louis, Missouri. This was the last steam locomotive used in revenue service by SP. Union Pacific 814: Rock Island Depot Museum, Council Bluffs, Iowa. Union Pacific 833: Utah State Railroad Museum, Ogden, Utah. Union Pacific 838: Union Pacific Railroad, Cheyenne, Wyoming. Union Pacific 844: The last steam locomotive built for Union Pacific Railroad (12/1944). Part of UP heritage fleet, often used for running in excursion service, and on occasion revenue service. Never retired, longest continuously operating steam locomotive on a Class 1 Railroad. Kept at Cheyenne, Wyoming when not on excursion. Wikimedia Commons has media related to 4-8-4. ^ a b c d Alfred W. Bruce. (1952). The Steam Locomotive in America: Its Development in the Twentieth Century. New York. pp. 296, 299, 308–309. ^ Dunn; et al. (2006). Super Power on the VR: Victorian Railways 4-8-4 'H' Class Pocono. Melbourne: Train Hobby Publications. p. 15. ISBN 1-921122-07-2. ^ "Centro-Oeste". Archived from the original on 2009-10-23. ^ "Grand Trunk Western / Canadian National 4-8-4 "Northern" Type Locomotives". Archived from the original on 2014-07-28. Retrieved 2012-11-17. ^ James A. Brown and Omer Lavallee. Hudson Royalty. Trains Magazine, August 1969. ^ Stora, T. (2002). "242 A 1, three cylinders 4 8 4". French Compound Locomotives' Homepage. Retrieved 2008-02-08. ^ a b c d Holland, D. F. (1972). Steam Locomotives of the South African Railways. 2: 1910-1955 (1st ed.). Newton Abbott, Devon: David & Charles. pp. 108–111. ISBN 978-0-7153-5427-8. ^ a b c Paxton, Leith; Bourne, David (1985). Locomotives of the South African Railways (1st ed.). Cape Town: Struik. pp. 77–78. ISBN 0869772112. ^ a b Durrant, A. E. (1989). Twilight of South African Steam (1st ed.). Newton Abbott, London: David & Charles. pp. 107–109, 194–198. ISBN 0715386387. ^ Naylor, Andrew. "Madrid Railway Museum photos". Andrew Naylor's travel and transport photos. Retrieved 16 February 2016. ^ a b "Philadelphia & Reading 4-8-4 "Northern" Type Locomotives". Archived from the original on 2015-12-22. Retrieved 2012-11-17. ^ "Southern Pacific 4-8-4 "Northern" Type Locomotives". Archived from the original on 2010-12-30. Retrieved 2012-11-17. ^ a b "4-8-4 Northern Type Locomotives". Retrieved 2009-09-01. ^ a b "NC Transportation Museum - Fire Up 611!". Retrieved 2015-06-19. ^ a b "611 - Virginia Museum of Transportation". Retrieved 2015-06-19. ^ Kemp, Charné (13 May 2017). "Tjoekepaf deur die Noord-Kaap". Die Burger - By. pp. 4–6. ^ Charné Kemp. Tjoekepaf deur die Noord-Kaap. Die Burger - By, 13 May 2017. pp 2-6. ^ Pueblo Railway Museum - retrieved 16 October 2011. ^ "Atchison, Topeka & Santa Fe Northerns". Archived from the original on December 16, 2004. Retrieved 2007-09-20.